It is the wish of every user to avoid having to deal with a wired doorbell considering the inconveniences that wired technology comes along with, for example, electrical nuisance and potential danger to property when the wires are mishandled. It is for this reason that a Moko wireless doorbell was designed. This is a Standard plug doorbell whose receiver does not require the use of a battery. It is simply connected to the power or electrical supply, and it works well from there. It is durable, reliable and is rated over 200, 000 users who have approved that this kind of doorbell is not just a regular kind of doorbell and thus not a waste of money. It is simple, elegant and has a stylish surface made of ABS material. This material does not burn and has impact resistant properties such as easy to break on falling. The ABS material also makes the doorbell resistant to dust particles and water droplets during the rainy season hence the doorbell can be placed even outside, and it will still function properly. Besides, it is normally very easy to install since it has a user manual provided along with the packaging and does not require any with to do this. The standard plug is easily set up by placing the receiver into a power outlet. You do not need to purchase any batteries for the receiver to operate. The IP44 transmitter is provided. It is weatherproof and can, therefore, be used even outside. The installation package is provided. It has one push button, one plugin chime, two screws, one double-sided adhesive tape and a user manual with clear and easy steps. The double adhesive tape is efficient for use on both sides. The user manual is written in the standard language so that anyone can read and understand its components. The range of the wireless doorbell is up to 100 meters (328 feet) wireless range and can thus be used over these distances. It can be placed outside even close to the mailbox provided that the distance does not exceed 328 feet from the house. It is provided with 32 ringtones and three levels of adjustable volume levels for the customer to choose. The receiver is then plugged into a power socket or outlet of about 110 to 220 Volts, and a frequency of 433 MHz The plug type used is the standard US plug. Moreover, it is mostly provided white in color thus giving it a new exciting appearance. It is water resistant and can, therefore, withstand long periods of rain. Also, it is not harmed by dirt and dust particles, unlike other doorbells. This increases its flexibility and a wide range of placement, even outside the house or office. A wide range of distance, 328 feet. 32 chimes provided with three levels of volume. Q: Does the remote transmitter have a light especially when pressed? A: Yes, it does. Blue light is seen when it is pressed. Q: Can I use more than one? A: Yes. However, you will have to delete the code for one receiver. That is because one remote transmitter can control several receivers. Q: How do I remove the code? A: Press any key located at one of the sides of the receiver. You may be required to press the key for at least ten seconds. 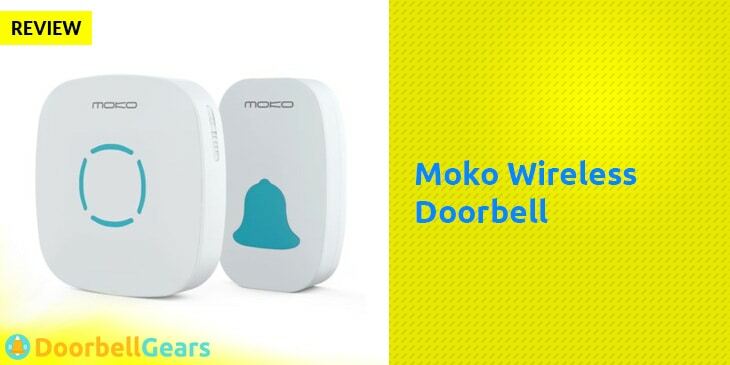 The Moko wireless doorbell is among the highest rated and used doorbells. This doorbell is perfect for home and office use. It is durable and can withstand rainy seasons without damage. The doorbell has an appealing design that keeps it aesthetically beautiful wherever it is set up. The IP44 remote transmitter is exceedingly flexible such that it can withstand all kinds of weather and thus can be used even outside. Its durability is assured even during bad weather. Also, the receiver does not require high voltages of power and can, therefore, be set up even at homes where such voltages of power are available. The Moko doorbell is affordable and appealing for every user. Invest in this doorbell and you`ll be safe for as long as it is working.